The American Heart Association | American Stroke Association teamed up with Powernet, the Avondale Comprehensive Development Corporation (ACDC) and Gabriel’s Place to host the Taste of Avondale last night. As part of its holiday campaign, Powernet employees collected and donated 65 crock pots and ladles. The American Heart Association matched each crock pot with a slow cooker recipe cookbook. Avondale residents who received them were invited to participate in the Taste of Avondale in January. 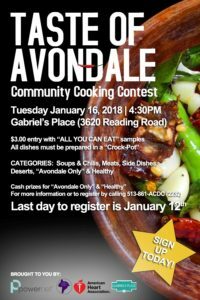 The event is a healthy cooking contest for the community and the categories include: Soups and chilis, meats, side dishes, desserts, Avondale Only and healthy. The contest featured all-you-can-eat samples, which were included with $3 admission for the public.